I recently started getting dashboard notifications from a woman on Google+. Every time she posted something, the little bell at the top of my gmail would change colors. I was unusually lazy about it, clearing the notification without muting her. Day after day I received a notification from her. Finally I took the time to remove her from my circles. It seemed more drastic than muting, and I was ready for drastic. Surely uncircling her would make the notifications stop. But, no, they continued. And they got worse. I started getting notifications each time she posted something. This woman shared her blog post? I got a notification. This woman reshared a stupid video? I got a notification. This woman reshared a picture of a cute baby that wasn't even hers? I got a notification. Why was this happening? Because I usually mute people after the second notification infraction, I had never encountered this problem. I thought that uncircling her would protect me. It didn't. She was sharing her posts with extended circles, probably thinking she would get the benefit of not only the people she had connected with, but also the people with whom they had connected. But that isn't how life works, and it certainly isn't how social media works. Just because someone I know has decided to connect with you, it doesn't mean you now have free access to me anytime you want it. I realize there are a lot of people who feel overwhelmed by Google+, and aren't sure how to share things to their best advantage. 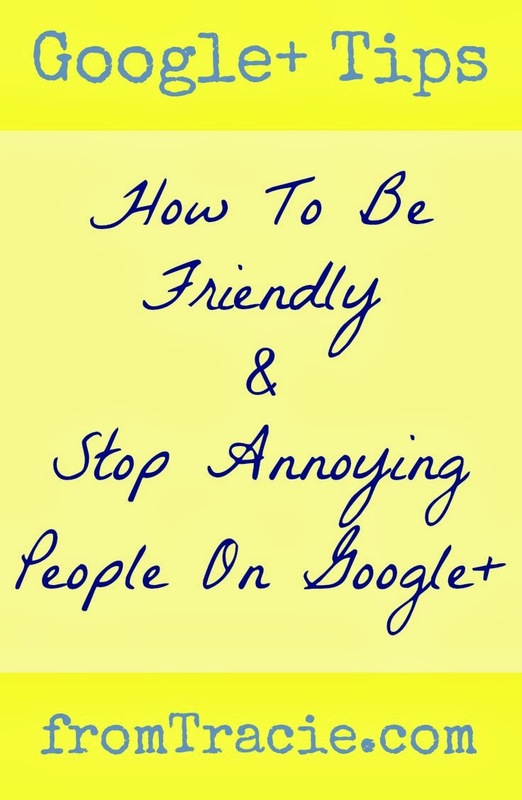 I have a few tips to help you be friendly and stop annoying people on Google+. Because annoying people is never a good way to make friends or grow your social media following. I don't get on Google+ to pour out my deepest darkest secrets (that's what a blog is for, right? ), so there is no reason to limit who sees my posts. Unless your blog is private, you want it to be seen by everyone, so it makes sense that you share your links and updates with the public on Google+. Sharing your posts publicly ensures that anyone can see them, and it enables people to reshare them with their circles. There is another benefit to public sharing: it gives your posts more opportunity to show up in search results. Don't give up one of the most important features of Google+, the SEO benefits, by sharing your post privately. One more thing about sharing publicly. When I look at your Google+ profile, and don't see any publicly shared posts, I can't tell if you are active on the platform, or if you are sharing things that interest me. Why would I add your to my circles? It is always a good idea to see how your profile looks to people who do not have you in circles yet. This is easy to do. Go to your profile. At the top of the page, the default is "View profile as: Yourself." If you click on the drop-down arrow, you will be able to switch to Public. This will enable you to see your profile as someone who is not yet connected with you. Look at your profile objectively, and see if it is a profile that you would want to connect with. If not, make the necessary changes. Just like the story I shared above, if you share your posts with extended circles, you may be sending unwanted dashboard notifications to people who don't even know you. This is a good way to get muted or even blocked. Just say no to extended circle sharing. There is no benefit to sharing with extended circles that outweighs the possibility of annoying people. 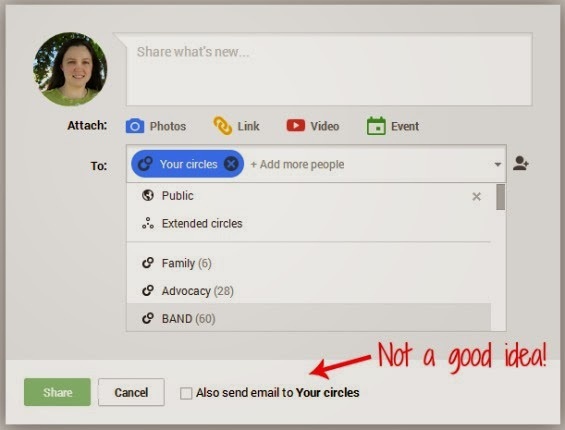 When you share with just your circles (which I hope after reading this you will do less - sharing publicly on Google+ is your friend), there is an option to "Also send email to your circles." For the love of people everywhere, do not use this feature. If you force your way into people's email inbox, they will not be happy or amused. Especially if you do it for every little update or reshare. It will get you muted, blocked, and sent away. I don't care if you are my best friend, an author I admire, someone I want to connect with for business purposes, or the most interesting person in the world - if you send me unwanted notifications or emails, I will always remember you as the annoying person who crossed boundaries and didn't use Google+ correctly. No one has time to add yet anther social media platform to your schedule. I understand this. But Google+ is worth the time. You know those SEO benefits you get from sharing posts there? The more interaction, comments and +1's, you get on your posts, the higher Google ranks them. Remember: You get out of social media what you put into it. Social media is only social when you make it that way. If you stop by Google+, throw out a link and run away, you will not make friends. Spend a little time there each day (or a few days a week), and interact with people. 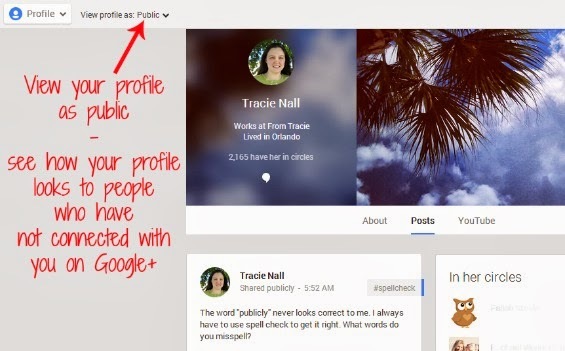 This is how you will really see a benefit from Google+ and make friends. Start sharing over there, and more importantly, interacting with other people's shares. You will find that it is easier to use than you thought. And as long as you aren't spamming people with notifications or emails, you will find most everyone friendly and ready to help answer any questions you have. Do you want to make sure those annoying notifications that have nothing to do with you do not pop up on your dashboard? After figuring out that the unwanted post notifications were coming from someone who was not even in my circles, I went to my settings to figure out how to make her go away and keep other people from showing up in the same annoying way. It was an easy fix. The first option is "Who can send you notifications?" Make sure you do not have it set to Extended Circles or Anyone. Either of those options leave you open to have annoying notifications pop up all day long. If you set it to Your Circles, you will still get notifications when someone who is not in your circles comments on your post or mentions you in a post or comment, but you will not get notifications when they post something. 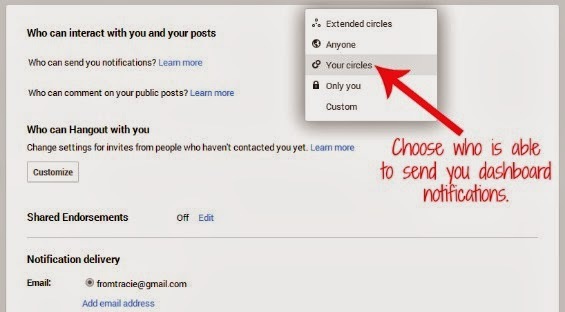 Further down the page you have the ability to choose your email notification settings. I have turned off almost all email notifications, because I do not need a deluge of emails coming into my inbox all day long. If you want more information about how best to share posts on Google+, check out this post from The Strategic Mama: Are You Hurting Your Blog Traffic When Sharing On Google+? If you want to connect with people on Google+, check out the Fabulous Blogging Community (think of Google+ communities like groups on facebook), you will find people who are new and learning, as well as people who are willing to answer your questions. They are a supportive group. Are you on Google+? I am! Let's be circley friends --> +Tracie Nall. Do you have a question about Google+? Share it in the comments and I will try to help you with answers. 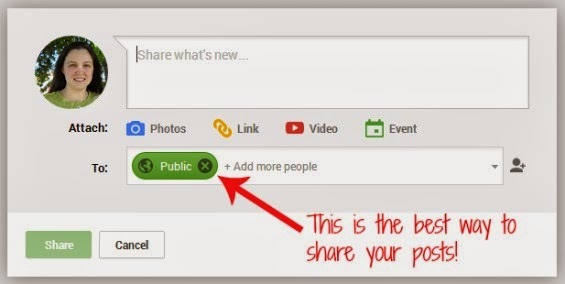 Or share your best Google+ tip. This is great to know. I actually had someone that shared stuff with me several times a day and I couldn't figure out how to get the notifications to stop, so I uncircled her. I don't blame you for uncircling her. It is too much to have that many notifications coming at you all day long. Like a loud noise that is blocking out the pretty music you are trying to hear. The email sharer drives me nuts!!! Great tips! They really need to stop. And I think some of them don't even realize how rude it is; they are just trying to promote their stuff. But when you promote that way, you really just end up hurting yourself. Thanks for the tips! I always forget about Google+! You are so very welcome. Add it to your schedule - it really is worth it! Awesome tips, Tracie. I went in a changed a few settings based on your recommendations - thank you! I just got into Google+ about a week ago and I have to say it's a bit confusing. I can reply to some blog comments, but others don't even have an option to reply. Some people have their blogs linked to their Google+ profile, but others don't. I guess that's not so much Google+ being confusing. Perhaps people just aren't using it right yet. Thankfully, with 6 people in my circles, I'm not getting any annoying venn diagram action. Sounds like this could be a new way to annoy people. Groups I'm a part of still haven't figured out how to properly use "reply to all" in their email. We'll never catch up! It could be that some people aren't using it right yet. And having the Google+ comment system integrated in YouTube and some blogs has been VERY confusing for a lot of people. I'm thinking this is what you are encountering with things you can and can't comment on. Ooooh. The reply all. That is bad stuff right there. Those who share on extended circles like this are really annoying! Thanks for the tips! Annoying for sure! It doesn't help that there are so many sharing options - it can be quite confusing, especially for people who are new to the platform. Really good tips! I do get quite annoyed with emails sent to me from G+ so I know what you mean. All these points def relate to how I would personally get annoyed! Check those email settings, because it might be that you can eliminate most (if not all) of those annoying daily emails! Love this! I can't believe people would notify "extended circle" - don't they realize what they are doing? See? That's the thing. I think a lot (not all - but a lot) of them do NOT realize what they are doing. Or, maybe at least, do not realize how very annoying it is to those of us on the notification side of things. Yes, yes, YES!! I had a few bloggers recently send the email out to people EVERY. TIME. they posted. Umm, big time annoying! I get it. We all want eyes on our content but when you do it in a way that's spammy and annoying, it's a surefire way to keep me from ever reading it. The email is even worse than the dashboard notification. Ouch. You are right, doing it that way is definitely a turn off. I won't read it either. It's even worse when the content is not even relevant to what you normally share or what your life is like. I have been known to get mommy related posts and I'm thinking, "Dude, did you not check my profile to make sure I even had kids?!" One look at my profile and it's obvious I am not a parent so I get annoyed when I see stuff like "5 Tips for Raising Awesome Children." This is a great post on how to avoid spammy g+ posts. Its good to know what extended circles are and how it effects your potential network. Thanks! Hopefully it will help clear up some of the confusion people have about how to use Google+. I am very intimidated by G+ and I'm positive I've made ALL of these errors in sharing/posting. That lady isn't me, right?? This is a great post!! These are great tips! Thank you so much for sharing them. I am still learning Google+. You are so very welcome! I'm glad you are still working on learning it. Once you get the hang of it, you will be glad you stuck around. I recently had to mute someone because it seemed like she kept sending me things. I definitely only share things publicly unless I'm tagging a fellow blogger because she is in a post or maybe it's one of my co-hosts for a linkup or something. Very strange though. Thanks for sharing the awesome tips! Tagging for those reasons is totally acceotable. Actually, it is great! I think you totally have this G+ thing down. Oh Tracie, thank you for this. The email sharers drive me insane. I've had to mute SO MANY people. And how timely that we had the Google+ sharing links on the SITS page today! Thank you for these tips. I guess you still got emails from this annoying person because you were in her circles, right? Even though she wasn't in yours. Mute, mute away! I might be in her circles....but it is also a case of being in her extended circles, so people I'm circled with have her in their circles. Being able to mute is a wonderful thing. I just learned a lot of things that I did not know! Thanks so much for helping me use G+ better. You are so very welcome. Im happy I was able to help. I haven't utilized Google + as much as I should - that is another area of my social media I need to take advantage of. 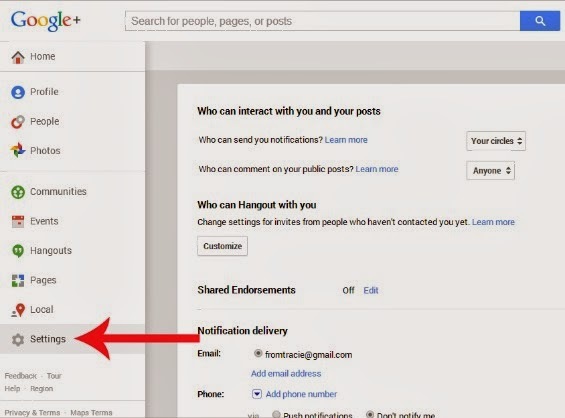 Great tips for G+! Thanks for sharing this with us. I always forget about G+. I am so confused by Google +. I am going to bookmark this and read it more thoroughly when I have time. Thanks for sharing!! This is a really great post. I have sent an email a couple of times to a circle or two but I don't do it on a regular basis. I know a few people that do and it does get annoying when it is constant. I don't mind it here and there. I guess I should go fix my settings though. Thanks Tracie...this was great info! Here and there isn't so bad. I think you have definitely had a couple of email-worthy things to share in the past year. Everyone can be expecting an email from me the day I get published in a book.....but definitely not when I am publishing a new blog post or resharing a stupid video. Oh, yes. I just muted 11 people I've NEVER FOLLOWED!! Share public, people. Unless it's family and you are only sharing images. and even then- just email them. Oh my gosh, someone has been doing this with me too!! I was wondering what was happening all of a sudden. I've had to block a few people who were doing that same kind of thing. I can't imagine that tactic is doing well for them! This is great info! I get so confused by G+ and I'll take all the education I can get. I do always share publicly, though. Phew! Some good points here, Tracie. I'm sharing this! You Go Girl These Are Really Great Tips! Tracie, these are great tips! I am guilty of the sharing with extended circles but only because in the beginning someone said it was a good idea. I'm changing that setting now. I so agree with the spammy e-mails from folks I don't know. So thank you, I am heading over and checking all of my settings now....thanks for the great info! Some great points here. I can imagine your situation, funny how people don't realise. I am starting on google+ more in the recent months and glad to know more about the settings. This was an interesting look at Google+. It is becoming incrfeasingly popular and people need to learn how to use it. Awesome, I'm so glad to read this - I've had the same issues! This explains those notifications! Thanks! These are some really good tips! I especially like the "don't be a spammer" section. Love your tips, I really need to increase my Google network and I'm sure your tips will help me! Excellent post, Tracie! As a complete newbie to G+, I've been almost afraid to post anything, for fear of becoming an annoyance. This really helps to explain a lot. Great tips. This post should be part of the google+ initiation process! great post. Very helpful. I am a blogging idiot and often feel like a minnow swimming w/ whales. learning how to navigate. Again, thanks. Very informative post Tracie! I don't think I've annoyed anyone yet on Google+ but that was clearly accidental. I have no idea what I'm doing there. This was very helpful for me. I can now go on Google+ with confidence. Thank you for this tutorial. I'd venture to say that a lot of people who are sending notifications are not doing so to be spammers, but because Google+ can be so confusing. I started on Goolge+ in the day before tutorials like this were around and I'm sure I spammed people unknowingly because I misunderstood the purpose of the circles and couldn't really find information to shed light on what to do with them. I assumed they were there so that when I posted something I could direct it to the audience that would most appreciate it. I thought I was doing them a favor, when in reality they were getting a bunch of notifications. Again, thanks for the tutorial. I'm getting back into Google+ again, partly because of helpful people like you. If these tutorials weren't available I'm sure I would have given up altogether because, as I said, the whole thing is pretty confusing. Thanks for this information! It is very useful...thanks for sharing! I do share with my extended circle because it seemed like a good idea, but I get how it totally isn't! I'm going to go through all your recommendations now! Uh oh, I had no idea that was how it worked. I, honestly, thought that putting "your circles" meant that they could see a post while the public couldn't, like how only your friends on FB can see a post if you have your account set up that way. I had no idea it sent notifications. This makes me want to go back and see if I was really annoying anyone. Mortified! At least I know I havent ever checked the email box. Thanks for posting this Tracie as I think all of us at some point have done this including myself. I had more than one person doing this and was getting over 1000 notifications a day! One person however was using automation plugins to propagate her blog and unknowingly sending out 20 to 30 posts a day just from her blog alone. Its an "old school" internet marketing tool and technique. Now if we could get some tips on getting notifications from communities this would be awesome. This has started with one of my followers who happens to be a friend in real life. I will send her this link to verify. Since she is out of the state, I cant double check for her. so.. when i post it as Public, I dont push notification to anyone's dashboard right? I stop posting and stop being active at Google Plus just because I get anoyed by people who send me notifications for every post they share, and I don't want to be like those guys. If share to Public means something good like that, I think i will be active again in Google Plus. Hey...I have a question. Is there an option where I can make sure that people in my circles don't get notified by my posts on their dashboard? I did turn off the option "Also send email." But that has nothing to do with the dashboard notifications. So...is there an option where I can disable the notifications of my own posts?